The Power of the Plate! 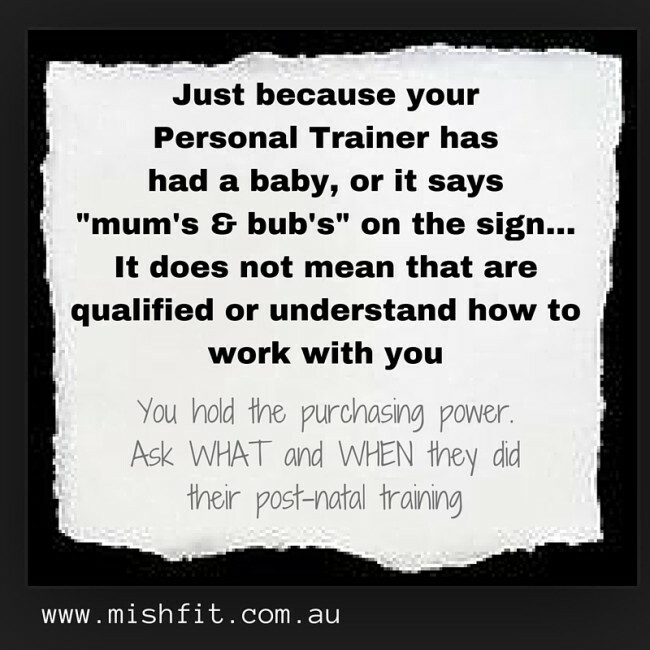 I have been working with Power Plate for nearly a decade and am qualified Master Trainer for the Pregnancy & Postnatal program for Power Plate (this means I am able to teach other Fitness Professionals this program). I have travelled to Sydney, South Korea and China to stay updated on the ever-evolving science of Whole Body Vibration. However, for the last 5 years have been developing a specific program using the Whole Body Vibration technology to work with women who have incontinence, prolapse, birth injuries and hypertonic pelvic floor. These women are traditionally overlooked in the fitness industry and often feel very unconfident about rejoining exercise. I call this my mishfit® Movement and Recovery Program. The Power Plate has the ability to release tight muscles, strengthen weak muscles and aid recovery… however it is no magic machine! The skills I teach women on the Power Plate are similar to what I teach on land. However, the science of Whole Body Vibration allows me to both accelerate the learning process because client’s can feel it working. Coupled with the investment in my education around fascia as well as an extensive initial consultation process has resulted in a near 100% success rate of women feeling confident to know what to do, when rejoining traditional exercise programs. Don’t believe me – then read what others have to say about my work! I have also had a number of Women’s Health Physiotherapists (and always welcome more!) go through the program and completely agree that I am working 100% within my scope of practice. Please get in touch, if you are a WHP and would like to see first hand how I work with women. The years before menopause are vital for bone density (and weight training for bone health is most effective) because in post menopause, your bone density will only decline So learning to lift safely, is VITAL! My goal when I work with women (and I tell them this in our first telephone call – see infographic below) is to “get rid of them as soon as possible… in the nicest possible way!” And it really is to bridge the huge gap between the physio bed and the gym floor. And the gap is huge. The women seek me out are often trying to get their mind around their change of circumstance. There is so much silence around incontinence, prolapse and other pelvic floor and sexual dysfunction. So for many women, they just can’t believe that they have never been told / or heard about it before. They often feel alone and broken. That is why, it is extra special when we have a client who wants to share their story, so other women don’t feel alone and know that there is help available to them. “I knew something wasn’t right when I went in for my six-week, post delivery GP check up. I had already consulted Dr Google and was slightly freaked out after finding descriptions and photos of some really severe problems. Even though I had been half expecting it, the news still came as a shock. What really surprised me though was that my GP couldn’t actually give me a lot of information about POP (Pelvic Organ Prolapse). Despite having two kids, she hadn’t experienced one personally and apparently didn’t treat many patients or knew mums with the problem. She jotted down the details of a sports physiotherapist, suggesting I discuss the issue with him, and recommended I do lots of ‘kegels’ in the meantime. When I left the clinic I was totally confused. Why would I see a physiotherapist? And why a sports physio? I didn’t know of any other mum who had experienced a prolapse after giving birth, and to be completely honest, had never even known that this was even something could happen to me. I felt like I had no one to turn to for advice. I left the doctor’s office slightly embarrassed and when I got home, I tossed the physiotherapist’s phone number in the bin. I decided the best plan for me was to do lots of these kegel exercises, as well as losing some baby weight to take the strain off my pelvic floor. So, twelve weeks after giving birth, I started running again. I can still remember the moment I felt my prolapse ‘drop’. I was standing in line for a coffee – after having first gone for a morning run, then walking three kilometers to the cafe – when all of a sudden it felt like something inside me had fallen out. I could feel a heavy bulge, and although it wasn’t painful it was very, very uncomfortable. From that point on, the feeling didn’t go away. Not knowing what to do, I figured the best way to fix the problem was to perform even more rigorous exercise, so I joined a local ‘mums and bubs’ fitness group. At first it all seemed great, as the type of exercises we did were all familiar to me. I’d been going to the gym for years and had trained with several personal trainers, so I felt comfortable doing squats, lunges, push ups, sit ups and planks. Plus, it was fun being able to do resistance weight lifting using the weight of my baby – or so I thought. Unfortunately those sorts of exercises weren’t fun for my prolapse. Despite the increased level of exercise, my prolapse was as noticeable as ever. I could feel it all the time, so it became a constant worry. And this was on top of all the other worries any new mum has, such as the health and well-being of her baby. My daughter was about fifteen months old when I reached my lowest point. I felt awfully alone and was upset with myself (not to mention my body) that I hadn’t managed to fix my prolapse problem through exercise. 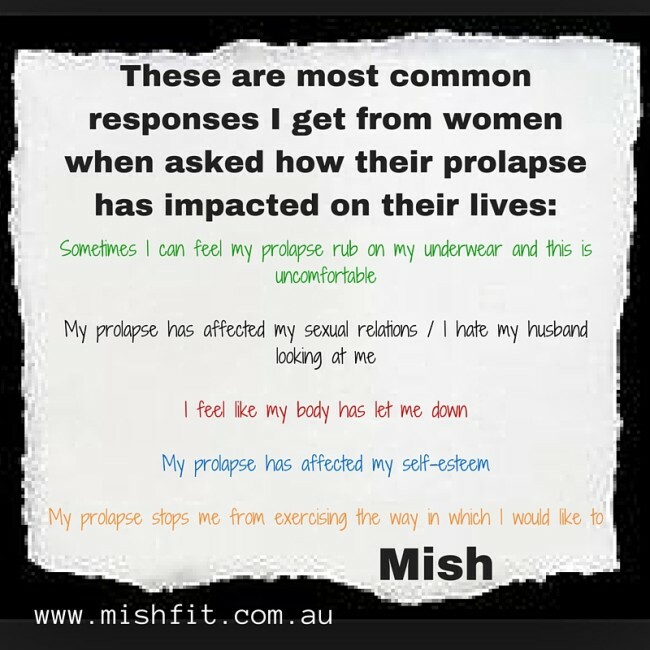 During a desperate session of Googling ‘prolapse exercises’ I stumbled upon the mishfit website. I couldn’t believe I had found a place where I might be able to get some help. I was actually annoyed with myself for not finding it sooner. I gave Mish a call the next day and we spoke for almost an hour. It was such a relief to finally talk to someone who knew what I was experiencing. I booked into five ‘Pelvic Floor Movement and Recovery’ sessions and was really excited to get started, but I had absolutely no idea what to expect. The first thing Mish advised me was to consult a women’s health physiotherapist; this is not just any physiotherapist, but one who specialises in postnatal recovery. I didn’t even realised such a person existed. So I made an appointment to see the Women’s Health Physio at Pelvic Strength Physiotherapy in Croydon the very next day. Liana diagnosed my pelvic floor muscle as being ‘frozen’ – according to her I had no strength down there at all. The conversation we had was extremely helpful because prior to this I had no understanding that what I was dealing with was a muscle problem that required targeted exercise. Even so, when I turned up for my first session on the Power Plate I was still expecting the same type of exercises I had done in my prenatal life. I soon discovered this would definitely not be the case. Instead we practiced proper breathing techniques, corrected my posture, checked the position of my hands and fingers when I walked, and practiced walking ‘lightly’. I was learning the fundamentals of pelvic floor strengthening without even breaking a sweat! After this, Mish demonstrated the Power Plate and explained that it works by reflexively switching on muscles like your transversus abdominis muscle (which I didn’t think I had one!) and lift your pelvic floor (which I knew I had, just didn’t know how to work it properly). To be honest, I was quite skeptical at first, as I found the whole concept a bit strange. I was used to using regular gym equipment: treadmills, elliptical trainers, rowing machines and weights. I had never come across a machine that simply vibrated at different intensities and I couldn’t imagine it having much of an effect. I tried it though, and although it took a couple of failed attempts before I got the hang of it, eventually I felt my pelvic floor muscles ‘lift’ – just a little, but it was amazing! I felt strong and in control of my body again. My second session on the Power Plate was great too. I felt like I had ‘got it’ and was able to consistently contract my pelvic floor. They weren’t incredibly strong, but there was noticeable more movement with each attempt. I left feeling confident and hopeful that I was finally on the road to recovery. Unfortunately my third rehab session was a disaster! I had struggled all week to do pelvic floor work on my own and felt continually weak, like I had no muscle strength at all. I was shocked that my body wasn’t responding, just when I though I knew how to control my muscle movement. Mish was amazing and took me back to basics – breathing practice followed by pelvic floor work on my back, off the Power Plate and then raising my feet up onto the Power Plate base to effectively use gravity to help lift the muscle. Incredibly (to me anyway) it worked! Looking back at my recovery using the Power Plate, this was my first ‘down’ moment, and I could expect plenty more of them to follow before I fully understood how my new postnatal body works and responds. The more familiar I became with how my pelvic floor muscles felt after each exercise and how my body feels just prior to my period starting, the more I became aware that there was a pattern to when my pelvic floor muscles responded less strongly. I realised that it wasn’t because I had failed in any way, or regressed in my recovery, but that my muscles were on a journey themselves and respond differently under stress, and at different times in my cycle. I have leaned that one of the most important elements of my postnatal journey is to be completely mindful of my body – understanding it’s own peculiar idiosyncrasies, strengths and weaknesses. My pelvic floor speaks to me and I have learned to listen. After two more rehab sessions on the Power Plate I was set free with my new pelvic floor strength, control and awareness of my body. Mish advised me to train with Thea who works locally with women just like me. I was able to do training that initially was within a small group setting for women who all had POP or significant pelvic floor weakness. I then ‘graduated’ to mishfit mothers™ sessions and was able to partake in group exercise again – all pelvic floor safe of course! Thea invested in a Power Plate about nine months ago and I was able to train with her using modified exercises and approaches that fully supported my pelvic floor and prolapse whilst at the same time benefiting from the Power Plate’s unique training approach. It was so nice to feel ‘normal’ again and get back to doing regular exercises! My daughter is now three and I’m expecting my second baby next month. At my most recent physio assessment, my therapist said that pelvic floor had improved from ‘frozen’ to ‘super strong’. She also said that if another physiotherapist was to assess me today, there would be no physical indication that I ever had any pelvic floor or prolapse problems! Amy’s is one of a number of inspiring stories from women who have experienced significant improvements in their prolapse and pelvic floor conditions following our Pelvic Floor Movement and Recovery Programme using the Power Plate and created by Mish. mishfit HQ is located in Pascoe Vale South, Melbourne. This is another wonderful prolapse success story!